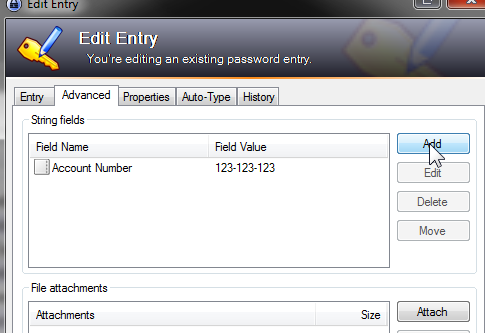 Keepass offers custom fields, which I frequently use. Mostly, I use the custom fields for two purposes. Credit card account numbers: Normally my credit card password is the password for the website. I'd rather not have the account number showing in the note field, so I put the account number in as a custom field. Security Questions: Websites, banks and credit cards often ask what they call "Security Questions". I written about these before, here, here and here. Essentially, they are "Insecurity Questions" and need to be treated like another password. 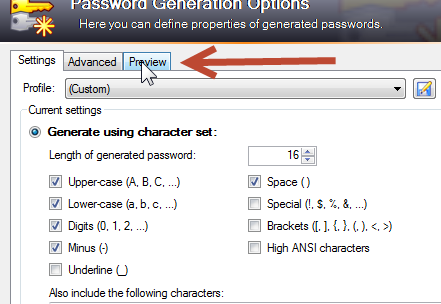 Do not generate a password, because that will overwrite your current password. Just open the password generator. Next set the generator for about 16 characters but no special symbols or brackets. You may need to tell a customer representative what this says, so make it easy on yourself. Now, select Preview. From the Preview screen, just copy one of the new passwords. And then close the password generator. Once back to the main screen, select the advanced tab. Then fill in a name and paste in the value. In the future, that name (like Favorite teacher for a security question) will be available from the pull down menu for that field. Now, when you right click on that password from the password list, you can select Copy Custom String, and paste it into a form. I find copying these fields much easier than selecting them from the notes and making sure I don't end up getting an extra space in by accident.